With Windows 8 we are seeing an upgrade in touch response due to an improve Ul. Often previous versions had not provided us with user friendly touch interfaces. This issued is being dealt with using a concept called “fuzzy hit targeting.” It works by monitoring a larger area rather than a few pixels such is the case when you use a stylus. Look at the picture below and you can see a red circle. Windows 8 will monitor this entire area for taps so that your touch will be read when you use the touch interface to drag the corner of the window. Inside the red circle you can see where the touch was actualized. By looking at the tool demoed it appears that the tap was recorded and the window size will be changed moving the corner around. 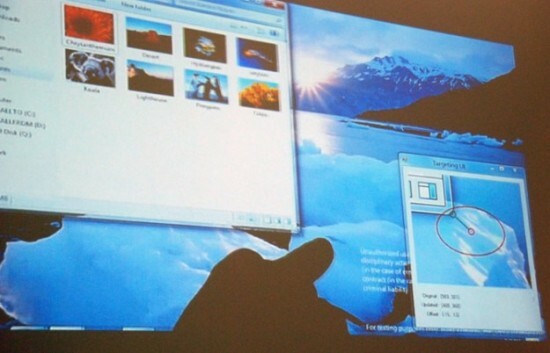 With Windows 8 reading a large area when using the touch interface you user experience will be highly improved.